While summer may have come and gone all too quickly, the arrival of autumn provides countless learning opportunities for your primary pupils. Dive into this collection of hand-picked seasonal lesson ideas to ensure you engage your class right up until winter. Introduce or recap the main signs of autumn with this simple presentation, which can be used in class or as part of an assembly. As the season progresses, build on this understanding by tracking daily changes in the weather on this interactive chart. If you're hoping to create an eye-catching display in your classroom, this header template is the perfect starting point. And why not make sure all work is fully on theme using this decorative writing paper in a variety of colourful designs? Bright and cheerful IWB display for focusing on the weather. Six themed slides (Autumn, Winter, Christmas, Spring, Easter, Summer) with editable text boxes for Day, date and Month. Six bold animations for weather (sunny, windy, raining, snowing, cloud/sun, lightning) which are activated by triggers. When you press on a weather symbol it moves across to a square with the heading ‘Today’s weather is…’ Font is Sassoon font which is embedded and editable. extra choice of Comic Sans for those of you who have had difficulties editing the original version. Here is some paper I have made for writing during Autumn topic. Just print the page you need. Hope it is useful. 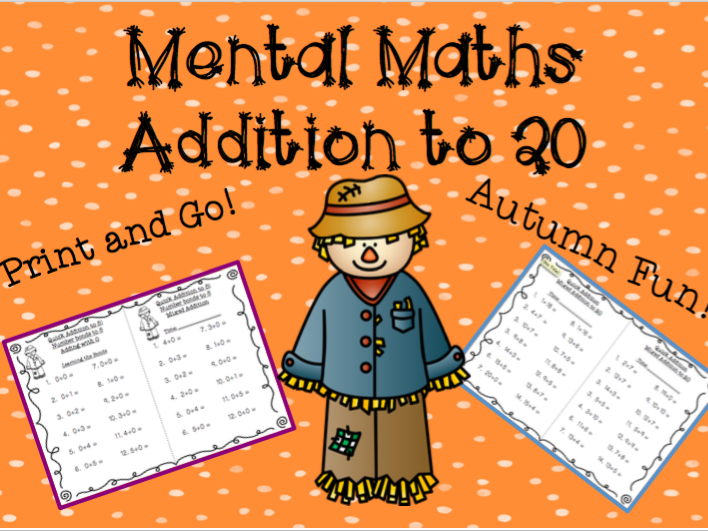 Support pupils as they practise adding to 20 with these autumn-styled printables, including a handy progression chart. Or, use this short poem as a stimulus for encouraging pupils to write and add their own verses about the things they can see and hear in the playground at this time of year. To make sure they've got to grips with seasonal spellings, why not also distribute this themed word mat? Take a walk outside to get some inspiration for decorating these tree outlines. Pupils could make a collage from leaves they've collected, or use paint, pencils or chalk to create an autumnal atmosphere. These Autumn styled printables are made to help your students revise/ learn addition to 20 facts. I have included a time section in each page. As the children progress and become quicker at their mental math additions, they will be able to see how they are progressing in their time. If you do not wish to use this, skip this part, especially if you feel it puts too much pressure on the students. Use this at your own discretion. Walking through the playground poem which I wrote in order for children to add their own verses inbetween based on what they had seen/heard etc. in the playground. Autumn word list to help with spelling and ideas for creative writing. These tree outlines make a great base for adding autumn colour - use paint, turn it into a collage, you could even add real leaves! Bring the outdoors into your classroom with this inspiring activity from the Woodland Trust's nature detectives website. Get started on an autumn topic with this taboo game, in which learners try to describe keywords without saying any of the forbidden terms. 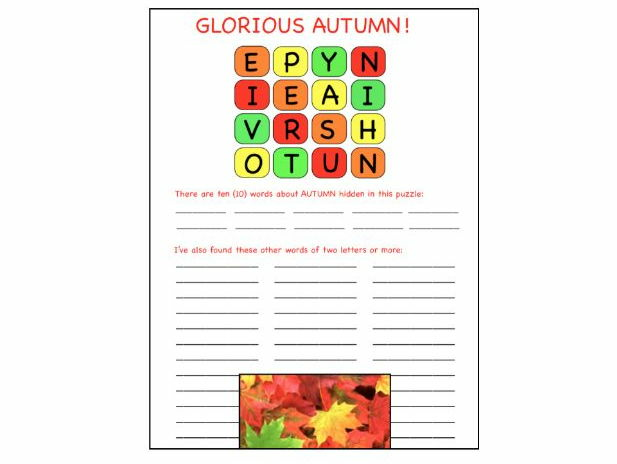 Similarly, this autumnal word puzzle offers an ideal introduction to thematic vocabulary. Move onto this sensory poetry lesson and support students as they compose their own poem using differentiated resources. This is an Autumn themed version of the game, although I have other versions available aswell. There are different ways of playing this game. This is how I play it. I choose one child to come to front of class. They have their back to IWB. The rest of class have to describe the thing in red to them, without saying the words written in brown. Another five minute filler for teachers. Embedded in this puzzle are ten words associated with Autumn and 100 other general vocabulary words. Full instructions, templates in colour and in black and white, a thematic vocabulary and an answer key are included. If you were one of the first 8 people to download this puzzle, you'll notice that the answer key was for another puzzle. Mea culpa. The correct key is included now. A whole lesson to support students in planning and composing their own autumn senses poem. Differentiated resources and a range of activities to support all learners.